Summerfest: Who else will play the Marcus Amphitheater this summer? Who else will play the Marcus Amphitheater this summer? Since I have the musical taste similar to that of a 16 year old girl, I was awfully excited to see the announcement of Kanye West touring with Rihanna, N.E.R.D. 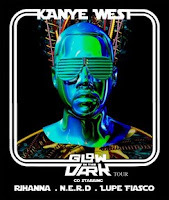 and Lupe Fiasco this summer, but as I write this, the closest the Glow in the Dark Tour will be to Milwaukee is Chicago, May 23. I see the tour extends in to early June, so maybe, just maybe Milwaukee will be lucky enough to see this lineup at the Marcus Amphitheater during Summerfest. The other possibility is to see Kanye come to Milwaukee prior to Summerfest, like The Police playing the Marcus Amphitheater after the Summerfest run. I AGREE!! HE NEEDS TO COME TO MILWAUKEE!! !